Following my prior posts XAITMENT Brings Emotional Intelligence To Serious Games, here are some inspiring news from xaitment's monthly update. xaitment inc., one of the leading developers and service providers of artificial intelligence for games and simulation industry and Forterra Systems Inc., the market and technology leader in private virtual worlds, have teamed up to incorporate the German AI solution into upcoming products. "xaitment provides an outstanding value to Forterra OliveTM developers that require realistic NPC AI. This technology will allow Forterra partners to rapidly create and deploy virtual worlds for a wide variety of applications, particularly for large-scale training and collaboration environments”, said Valete Hopkins, Program Manager. 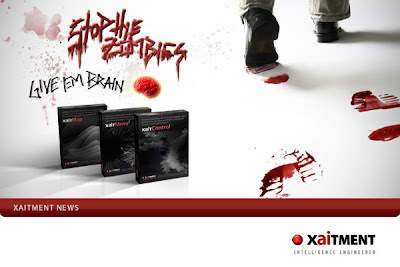 xaitment will present their latest products for games and simulations at Cebit 2009 3-8 March, at the Microsoft booth A26, hall 4. xaitment will demonstrate how easy their modular AI products can be integrated into Microsofts well known antMe!-project to model the bot behaviours. xaitment gives talented developers insight into the work of an AI specialist at the Making Games Talents event in Frankfurt a.M. 7-8 March. xaitment GmbH, one of the leading AI developers for games and simulations, presents itself and its modular xaitEngine at this year’s Game Developers Conference in the German pavilion with booth 5428 NH. The GDC takes place on March 23-27, 2009 in the Moscone Center in San Francisco, CA. xaitment kindly invite us to stop by and visit them at their booth.